Joella Connell Exhibit | Leeds Arts Council, Inc.
Joella (JoJo) Connell is the Leeds Arts Council’s featured artist in April. The public is invited to the opening reception on Sunday, April 7, 2019, 1:30pm – 3:30pm to view her beautiful paintings. Admission is free. Joella was born and raised in Walnut Grove, Alabama. She attended Jacksonville State University, where she majored in English, minored in physical education, marched with the Southerners as a ballerina, and met her husband-to-be. She later earned her master’s degree with a concentration in physical education. Joella lives in Saks, Alabama with her husband, W.E. (Duck) Connell, Jr., where they attend First Baptist Church of Saks. Their son Scott and his wife Cannon have two girls, Sara and Emma. The Grands are the sunshine in their lives. Joella taught physical Education at Saks High School for 25 years, sponsoring cheerleaders for 16 of those years. Retiring at the young age of 45, Joella was ready for the next phase in her life. She joined a hiking club and has backpacked many times in the Smokies, but her first big adventure was backpacking from the North rim of the Grand Canyon, down into the canyon, and back up the south rim. She backpacked up to base camp on Mt. Rainier, spending the night on the snow at 10,000 feet. Joella has also ridden in the Bicycle Ride Across Georgia (400 miles in 7 days) twice and has ridden the Cheaha Challenge once. Besides sports, her hobbies include gardening, reading, traveling, and camping with her husband. Joella has traveled with her church on mission to Honduras. She and W.E. have traveled to New Zealand, Alaska, and have taken many shorter trips with the entire family. Their latest trip was to Lake Tahoe, where the grand girls learned to snow ski. 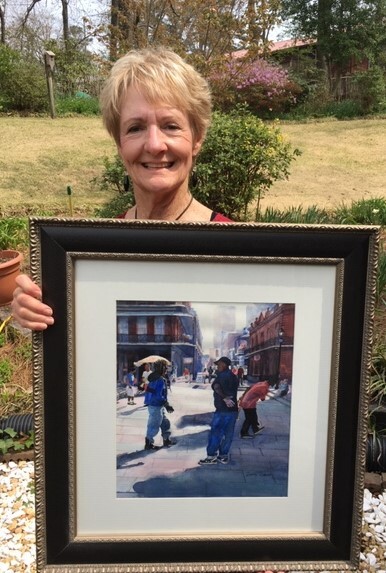 Joella has entered pieces in ARTS ALIVE!, a juried show held in Florence, Alabama. She enters the juried show at the Gadsden Art Museum most every year, where she has won two honorable mentions, one 2nd place, and one 1st place. On April 6, Joella will reach the young age of 75 and she’s still going strong. When she’s not painting, gardening, or traveling, she’s doing Zumba and Yoga and hiking whenever she gets the opportunity. Ms. Connell’s paintings will be on exhibit through May 3, 2019. The Arts Center is located at 8140 Parkway Drive, in downtown Leeds. The gallery is open during events. In case of inclement weather, call the center at 205-699-1892 to confirm opening hours. This entry was posted in Visual Arts by admin. Bookmark the permalink.